Alan Judge scored twice as promotion-chasing Brentford ended Notts County's three-match winning run. Adam Forshaw put the Bees ahead from the spot after Haydn Hollis saw red for a foul on Clayton Donaldson. Judge made it 2-0 just before the break, collecting Alan McCormack's pass and shooting home at the near post. The winger scored his second from close range just after half-time but Jimmy Spencer scored a consolation when he lobbed David Button late on. The visitors were on the back foot from the moment Hollis was given his marching orders by referee Charles Breakspear just after the half hour. The defender hauled down Donaldson after the Brentford striker had chested Tony Craig's long pass into the penalty area. Forshaw's calm finish from the spot set the west London side up for a comfortable afternoon, with Magpies number one Bartosz Bialkowski the busier of the two keepers. Judge's second, his fifth goal since joining on loan from Blackburn in January, came after Bialkowski had twice denied Toumani Diagouraga from close range. The visitors offered little in return but Alan Sheehan saw his free-kick palmed behind by Bees goalkeeper David Button. The victory was Brentford's first in four matches and moved them six points clear of third place. Wins for Tranmere, Carlisle and Crewe mean Notts County slip back into the League One relegation zone, with Shaun Derry's side now three points from safety. "I was really pleased with rotation and movement of the forwards today. "They posed a real threat. They had energy, pace and of course they had quality as well. We have got good options. "The only criticism again is that we could be more clinical in front of goal. "We are in good shape; 84 points, six games to go, three at home, three away, and the boys are playing good football." Match ends, Brentford 3, Notts County 1. Second Half ends, Brentford 3, Notts County 1. Attempt missed. James Spencer (Notts County) right footed shot from outside the box misses to the right. Foul by Jonathan Douglas (Brentford). James Spencer (Notts County) wins a free kick in the attacking half. Attempt saved. George Saville (Brentford) right footed shot from outside the box is saved in the bottom right corner. Attempt missed. Alan Sheehan (Notts County) left footed shot from very close range is too high following a set piece situation. 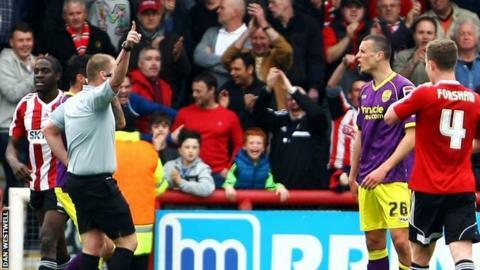 Harlee Dean (Brentford) is shown the yellow card. Goal! Brentford 3, Notts County 1. James Spencer (Notts County) right footed shot from the centre of the box to the centre of the goal. Attempt missed. Jake Bidwell (Brentford) right footed shot from the left side of the box misses to the right. James Spencer (Notts County) wins a free kick on the right wing. Jake Bidwell (Brentford) wins a free kick on the right wing. Foul by Jamal Campbell-Ryce (Notts County). Attempt missed. George Saville (Brentford) right footed shot from the centre of the box is too high. Substitution, Brentford. William Grigg replaces Clayton Donaldson. Jake Bidwell (Brentford) wins a free kick on the left wing. Dean Leacock (Notts County) is shown the yellow card. Stuart Dallas (Brentford) wins a free kick in the defensive half. Foul by Dean Leacock (Notts County). George Saville (Brentford) wins a free kick in the attacking half. Foul by Gary Liddle (Notts County). George Saville (Brentford) is shown the yellow card. Foul by George Saville (Brentford). Gary Liddle (Notts County) wins a free kick in the attacking half. Jonathan Douglas (Brentford) wins a free kick in the attacking half. Foul by James Spencer (Notts County). Jonathan Douglas (Brentford) wins a free kick on the right wing. Substitution, Brentford. George Saville replaces Adam Forshaw. Substitution, Brentford. Harlee Dean replaces James Tarkowski. Corner, Brentford. Conceded by Bartosz Bialkowski. Attempt saved. Alan Judge (Brentford) right footed shot from the centre of the box is saved in the bottom left corner. Corner, Notts County. Conceded by David Button.